Need to take the TOEFL exam? You are not alone. Over 800.000 students take the Test of English as a Foreign Language™ each year. More than 2,000 universities and programs in the United States and Canada use the TOEFL exam to evaluate the English proficiency of applicants who are not native speakers of English. The reason for this is simple: Academic institutions want to be sure that these applicants can read, write, and comprehend spoken English so that they can succeed in the college classroom. Elizabeth Chesla is a lecturer in English at Polytechnic University in Brooklyn, New York, where she coordinates the Technical & Professional Communication Program. She is the author of several books and study guides, including Write Better Essays, Reading Comprehension Success, Improve Your Writing for Work, and Read Better, Remember More. In addition, she is a content developer for LearnATest.com. 1. To explain the format of each section of the TOEFL exam. 2. To offer specific test-taking strategies that you can use on the exam. 3. To review the basic reading, writing, and listening skills you need to do well on each section. Building your English reading, writing, and listening skills is important, of course. But before addressing these specific skill sets, this book takes you through a review of basic study skills and learning strategies. It also helps you prepare a detailed study plan. The stronger your study skills, and the better you understand learning strategies, the more you will get out of each skill-building chapter. Each skill-building chapter of this book includes several practice exercises, and detailed answers and explanations are provided in Appendix A. Appendix B offers an extensive list of resources to help you further strengthen your basic skills. 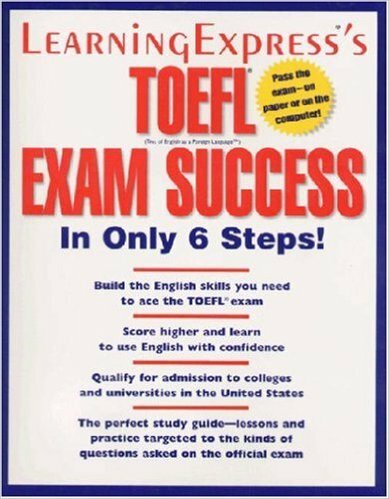 Chapter 6 provides general information about the TOEFL exam, including notes about registration and scoring. Though each chapter of this book is an effective skill-builder on its own, you will get the most out of this book by beginning with Chapter 1 and working through each chapter. Some of the later chapters refer to ideas and information discussed in earlier parts of the book, so you may find it most Effective to tackle Chapters 2-5 in order (you can read Chapter 6 separately at any time). However you proceed, read carefully, take good notes, and use your time wisely. Remember that you arc already on your way to success on the TOEFL exam.